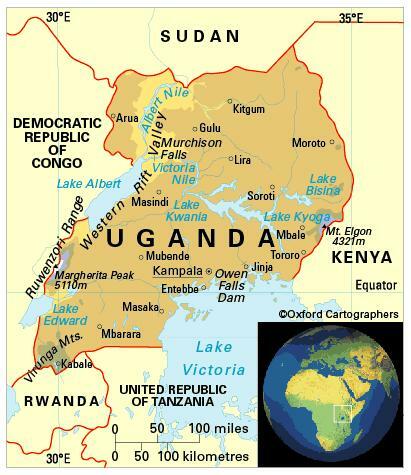 Uganda is a landlocked East African country lying astride the equator. It is bordered (clockwise from north) by Sudan, Kenya, United Republic of Tanzania, Rwanda and the Democratic Republic of Congo. Climate: Equatorial, tempered with breezes and showers. Cooler in the higher areas. Heavy rain from March to May, and in October and November. Little rainfall in the north-east, though north-east parts of the country experienced unusually heavy rainfall in the latter part of 2007 with heavy flooding displacing tens of thousands of people. The most significant issues are draining of wetlands for agricultural use; overgrazing, soil erosion and deforestation; water hyacinth infestation in Lake Victoria; and poaching. 36,346,000 (2012); 16 per cent of people live in urban areas and five per cent in urban agglomerations of more than a million people. The population growth rate stood at 3.2 per cent p.a. between the years 1990-2012. In 2012 the birth rate was 44 per 1,000 people (49 in 1970) and life expectancy was 59 years (50 in 1970 and 48 in 1990). and most of the rest of Nilotic peoples (Iteso seven per cent, Langi six per cent, Acholi five per cent, Lugbara four per cent, Alur, Karimojong and Kakwa) in the north and parts of the east; with minorities of Asians and refugees from neighbouring countries (2002 census). Uganda is classified as a low-income economy by the World Bank.